Live life like Tarzan amongst the trees - but with all the modern conveniences the loin-clothed fellow was never afforded. Designed by UK-based design/build firm Blue Forest, the beautiful eco-PERCH is an inviting luxury retreat that takes a cue from treehouse living. Featuring natural materials and an organic form, the eco-PERCH will fit amicably within almost any environment, creating a harmonious balance between contemporary living and nature. But best of all? This perch can be assembled on site in just five days! The four bedroom eco-PERCH is a luxury retreat that was inspired by Blue Forest‘s already popular tree houses. The new design sleeps four people and is delivered, assembled and commissioned in approximately five days (subject to site preparation). The design is also flexible enough to be adapted and re-adapted to suit your site and needs, and its small 20’x26′ footprint and prefabricated design minimally impacts the land — a bonus if you don’t end up placing this beauty in the trees! With a continuous roof surface clad in wood panels, the home effortlessly appears as a natural extension of its site. There are also options to install systems such as solar panels, grew water and more if you want to take the home completely off grid. Leave that poor tree alone. 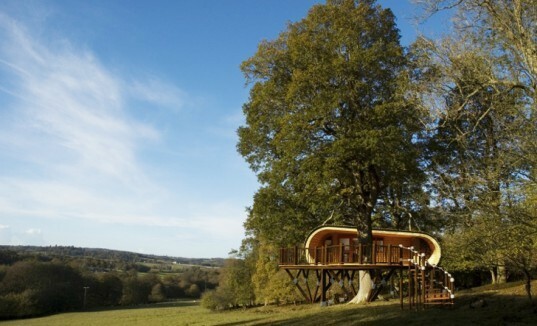 The four bedroom eco-PERCH is a luxury retreat that was inspired by Blue Forest's already popular tree houses. The new design sleeps four people and is delivered, assembled and commissioned in approximately five days (subject to site preparation). 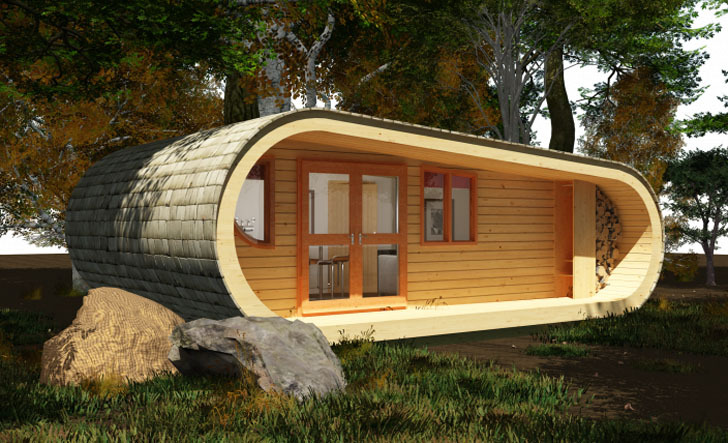 The design is also flexible enough to be adapted and re-adapted to suit your site and needs, and it's small 20'x26' footprint and prefabricated design minimally impacts the land -- a bonus if you don't end up placing this beauty in the trees! With continuous roof surface clad in wood panels, the home effortlessly appears as a natural extension of its site. There are also options to install systems such as solar panels, grew water and more if you want to take the home completely off grid.